Before being handed their diplomas last week, the newest Arizona State University engineering graduates were told the world needs them to go beyond merely being good engineers and become passionate pioneers. The plea came from two men in the midst of their own pioneering mission. In a surprise visit to the May 9 convocation ceremony, the pilots attempting to become the first to complete a transcontinental flight in an airplane relying only on solar power addressed the crowd of about 10,000 people. 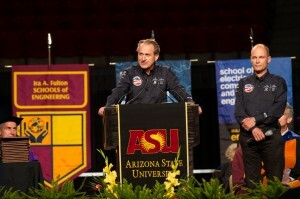 “We need to invent a better future” and young engineers need to help lead the way, Bertrand Piccard said to the gathering of nearly all of the 1,123 receiving degrees this semester from ASU’s Ira A. Fulton Schools of Engineering – plus about 9,000 family members, friends and other guests in attendance. Piccard was joined on stage by André Borschberg, his fellow pilot on the mission titled Solar Impulse Across America, just days after successfully completing the first leg of the flight from Moffett Federal Field near San Francisco to Phoenix Sky Harbor International Airport. The two natives of Switzerland said they could not pass up the opportunity to address so many graduates from a major American university “because our mission is not only about an airplane. It is about inspiration,” Borschberg said. Along their planned route through Phoenix, Dallas, St. Louis and Washington, D.C., to New York, they and their team hope to connect with students, teachers and community and government leaders. They want to use the interest generated by their endeavor to spark more dialog about the need to pursue innovation in technology and other areas that can promise to provide a growing world better resources to support itself – particularly more energy from sources such as solar power that are renewable, sustainable and less of an environmental detriment. So far, they are getting a growing amount of positive response, largely through social media, from people encouraging their efforts. The Solar Impulse website recently posted a photo of Piccard and Borschberg posing with Arizona Gov. Jan Brewer, and more than 2,200 people came to Sky Harbor airport to see their airplane. They considered their visit to ASU to speak to engineering graduates as a meaningful part of their voyage. “Our project involves almost all the different dimensions of engineering, so this is a significant moment,” Piccard said. Behind the scenes of Solar Impulse is a team of about 90 engineers, technicians, technical advisers, organizers, and communications and media managers. In addition as many as 80 companies have lent support in various ways. The pilots pointed out that the project involves the kind of diversity of skills and collaboration among experts in a variety of fields that is exemplified by ASU’s interdisciplinary approach to education and research. The concept for the Solar Impulse adventure began to emerge about a decade ago and the plane has been in design and building stages throughout the past five years. The project would never have come to fruition if team members had not overcome obstacles – technical and otherwise – that at times seemed insurmountable. 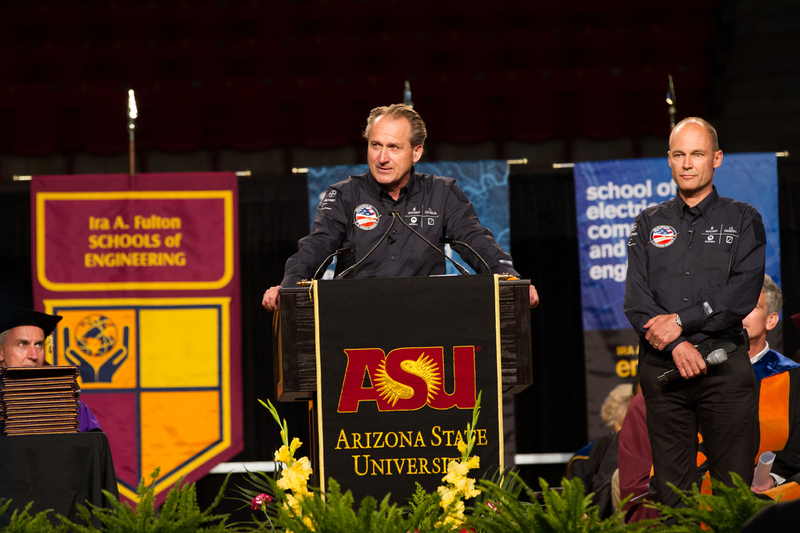 Borschberg told ASU engineering graduates the lesson to take from the team’s perseverance is that “every difficulty is a potential opportunity” to devise innovative solutions and achieve major advances. Piccard and Borschberg are not strangers to achievement. Piccard, a well-known psychiatrist and psychotherapist, is also a world-class aviator and adventurer. He and a partner won a transatlantic hot-air balloon race and later, with another partner, he made the first nonstop balloon flight around the world. He has earned some of the highest distinctions bestowed by the Fédération Aéronautique Internationale, the National Geographic Society and the international Explorers Club. Borschberg is an engineer who also holds a degree in management science from the Massachusetts Institute of Technology. He was a pilot in the Swiss air force and has been a successful financial manager and business investor and entrepreneur in technology- and Internet-based industries. He has been a member of prestigious international groups, including the World Presidents’ Organization, a global association of current and former chief executive officers of major companies. The two pilots’ flight across the United States is a step toward another accomplishment they plan to pursue two years from now: flying a solar plane around the world. “The visit from the Solar Impulse team, in the middle of their historic voyage across the U.S. made this a special and memorable convocation for our graduates,” said Paul Johnson, dean of the Ira A. Fulton Schools of Engineering. Read more about the Solar Impulse Across America mission and see a video of Borschberg and Piccard speaking at the Ira A. Fulton Schools of Engineering convocation on the Solar Impulse website.